A recurve riser perfect for the junior archer as a spare or replacement riser for your current bow. Made from high quality wood & available at our very affordable prices. Available in various sizes. Phoenix Archery are proud to present the ideal recurve bow riser for any Junior beginner who is looking to enjoy target archery. This junior recurve riser is available in various sizes & is perfect for child archers with limbs available seperately from 12lb pull to 18lb pull. This junior riser is available in a standard size & at an affordable price that will allow you to keep as a spare or replace a broken or damaged riser. Our fully trained bow technician’s can help to set up your bow at our fantastic indoor facility. Our 25 yard range located in Burnley, Lancashire is the ideal place for your child to begin their adventure into target archery. Phoenix Archery offer tailored lessons for beginners including our in-depth six week course which will ensure your child is taught all the skills necessary to enjoy the sport safely & securely. Our archery store located in Burnley offers a warm, safe & friendly environment for archers of all ages. Our qualified Bow Technicians are on hand to assist you in any bow alteration or customisation to make the bow the perfect fit. The Junior recurve trainer bow consists of a high quality wooden riser (available in both left & right handed) along with limbs (sold seperately) suited to the beginner. This is a very versatile & lightweight riser that offers a fantastic trainer bow at a very affordable price. 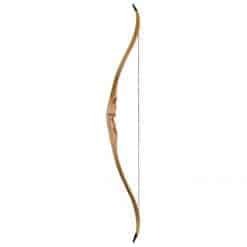 Please note that the bow supplied may vary in manufacturer from the bow shown in the images – This is only due to the demand for this product.